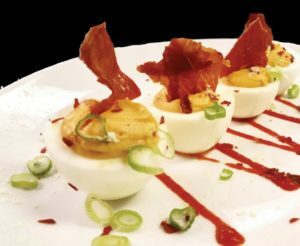 Check out this delicious Jerk Deviled Eggs from Chef Simpson. Christmas is an approaching and this delicious recipe is perfect for appetizers and snacks for your Christmas parties and get together. Shell eggs and cut in half lengthwise. Scoop out yolks into a small bowl and mash with a fork. Blend in mayonnaise, sour cream, ham, olives, chives, and seasoning. Spoon the yolk mixture into the egg whites. Makes 6-8 servings.